I have been having a blast learning more about my new camera, which Ben got me for Christmas after insisting that it was “much” too expensive. *Ahem. * Yeah right. He spoils me! It’s been so much fun playing with it, though. I got lots of shots of my parents’ new puppy, as well as many a round of Dutch Blitz by the fire. Best of all, I swear it makes my food look wayyy better than my old pics taken with my iPhone. I can’t wait to share some brand new recipes with you, just in time for 2014! 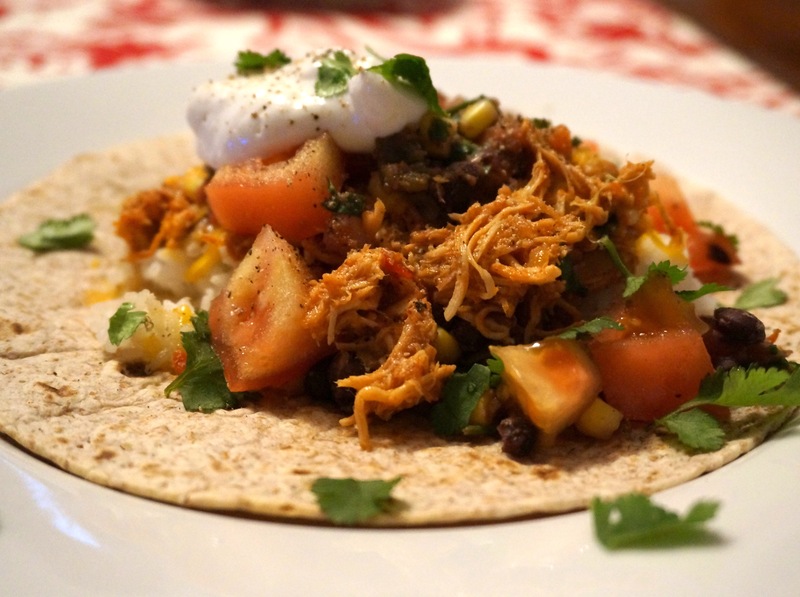 While Ben’s family was here, I tried out a new recipe for crock pot chicken tacos. It seemed like a good choice, since tacos are the kind of thing that everyone can create the way they like. There’s also something cozy about sitting around the table and constantly passing each other the topping ingredients (or at least it helps everyone work on their “please” and “thank-you”s). This was honestly one of the easiest recipes I have ever made (do I say that too much? :P), and they kept raving about it, so either they are just being extremely polite, or it really is a keeper. I like to think the latter? Anyway, this recipe was adapted from Iowa Girl Eats, one of the regular bloggers I follow. It literally has three ingredients (a few more if you make your own seasoning) that you probably already have in your pantry! Chicken, salsa, and taco seasoning. That’s IT! Shredding the chicken and returning it to the saucy goodness of the crock pot before serving allows it to soak up all the salsa and stay nice and juicy. Because we all know there is nothing worse than dry taco meat. I also served these with my tried-and-true Black Bean and Corn Salsa, a recipe which everyone always seems to like, and with awesome leftover potential! This recipe literally uses 3 ingredients! Just throw them all into the crock pot and set to low heat for 6 hours or until chicken is done, shred, and serve! So easy and soooooo good! Lightly spray bottom of crock pot with cooking spray. Carefully place halved chicken breasts in a single layer across bottom of the crock pot (if your pot is too small for a single layer like mine is, you can do two layers instead- just make sure to only use 1/2 of the taco seasoning and salsa for each layer!). Carefully lift up the chicken with a fork to allow the salsa to spread underneath a bit. Set crock pot to low heat for 4-6 hours or high for 2 hours, or until chicken is cooked through. Chicken should fall apart when you pierce it with a fork! Siesta time! After all, it IS New Year’s Day! You deserve it. When chicken is cooked through, remove from crock pot with a slotted spoon and transfer to a medium mixing bowl. Using two forks, shred chicken and return to crock pot. Mix chicken in so that it gets evenly combined with those yummy salsa juices! Set crock pot to warm until ready to serve. Meanwhile, cook rice and prepare toppings. When ready to eat, nuke tortillas for 30 sec to 1 min or until heated through. Cover with foil to keep warm. *Instead of using store-bought taco seasoning, you can easily make your own by combining 1/2 tsp garlic powder, 1 1/2 tsp cumin, 1/4 tsp onion powder, 1 1/2 tsp chili powder, 1/2 tsp paprika, 1/2 tsp each salt and pepper, and a pinch of red pepper flakes. 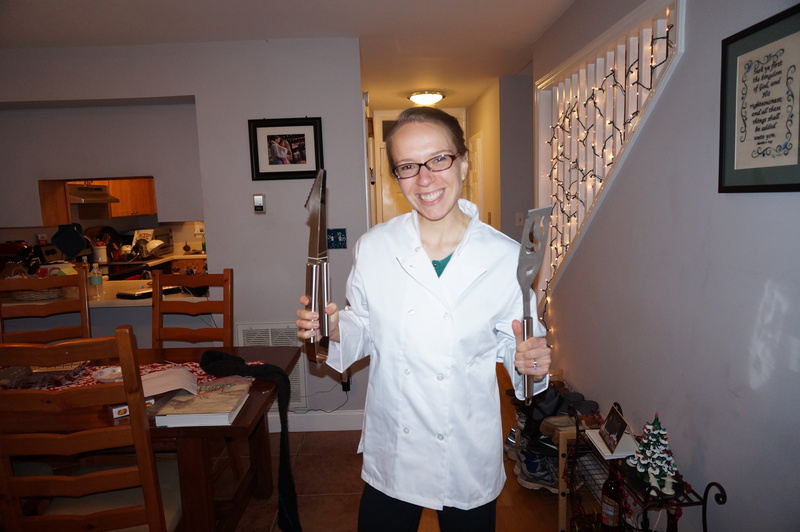 Oh… and I couldn’t help but to post this picture of my new chef’s jacket, given to me by Ben’s grandmother for Christmas. Don’t I look official now? Whew- Claire Tastes is in for some major improvements in 2014! I can’t wait!